OSWEGO – The Salvation Army of Oswego County is continuing a recent tradition to support its services for people throughout the county. 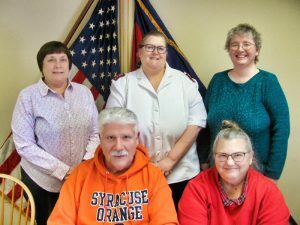 Several members of the Oswego County Salvation Army Advisory Board are shown at a recent meeting planning the Salvation Army Red Kettle Golf Classic. Front row, advisory board chairman and tournament chairman Tom Brown and advisory board member Carol Dexter. Back row, advisory board member Theresa Sugar-Scanlon, Salvation Army Corps officer Captain Heather Odom, and Deborah Daby, advisory board member. 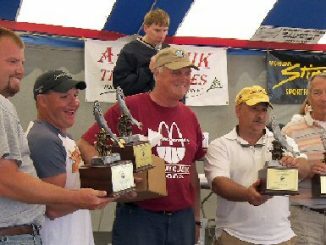 The Corps will hold its fourth annual Red Kettle Classic Golf Tournament on August 17 at Battle Island State Park Golf Course, 2150 State Route 48, Fulton. The tournament is scheduled for an 8 a.m. shotgun start. Registration fee includes 18 holes of golf, use of a cart, snack, and lunch. Dixon Golf will be on hand to run the Par 3 and Par 5 contests. Prizes will be awarded, raffles and silent auction will be available, and there will be games such as long drive, closest to the pin, putting contest, putting string, mulligans, and skin game. Major sponsorships and opportunities for businesses or individuals to sponsor holes are available. Sponsor names will be publicly displayed with signs on the course and promoted the day of the event. The Oswego Corps, responding to ever-increasing needs, provides fresh-cooked meals five days each week in both Fulton and Oswego, groceries from its food pantries, winter garments, and many other services to individuals and families in need throughout Oswego County. In February, the Corps provided 646 soup kitchen meals in Oswego and 372 in Fulton. It provided 123 Fulton households with groceries for 2,781 meals and 98 Oswego households with groceries for 2,106 meals. It also distributed over 800 loaves of bread. Fifteen households purchased low-cost foods through the Food Sense program.